Jameis Winston was nearly flawless Monday night, completing 25 of 27 passes and running for 25 yards and a score as the Seminoles gave Pittsburgh a rude welcome to the Atlantic Coast Conference. PITTSBURGH (AP) - Redshirt freshman quarterback Jameis Winston passed for 356 yards and four touchdowns in a spectacular debut and No. 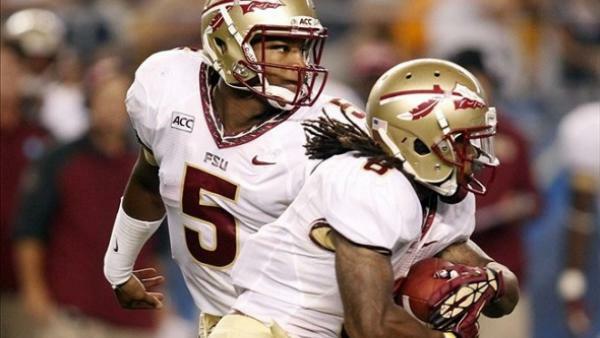 11 Florida State dominated Pittsburgh 41-13 on Monday night. Winston was nearly flawless, completing 25 of 27 passes and running for 25 yards and a score as the Seminoles gave the Panthers a rude welcome to the Atlantic Coast Conference. Rashad Greene caught eight passes for 126 yards and a score and Nick O'Leary hauled in three touchdown passes for Florida State. The Panthers had been pointing to the opener from the moment the program announced the move from the Big East to the ACC nearly two years ago. Playing in front of a rare sell-out, Pitt simply couldn't keep up with the defending league champions. Don't plan on him giving up the gig anytime soon. Ward, however, didn't become a star until he finally cracked the starting lineup as a junior. Winston appears to already be there a game into his career. Winston connected on his first 11 passes, missing on his 12th when wide receiver Kenny Shaw couldn't quite get his right foot all the way inbounds. The 6-foot-4, 227-pound kid from Hueytown, Ala., nicknamed "Famous Jameis" did a little bit of everything. Twice he pulled himself free from a defensive lineman's grasp to find a receiver downfield. He converted a first-and-28 with a 36-yard strike to Greene and even served as the lead blocker for Devonta Freeman when the running back broke into the secondary. Pitt's defense, which ranked 17th in the country last season, appeared unsure on how to stop him. Wary of the speed of Florida State's wide receivers, the Panthers gave Greene and company plenty of room to maneuver. Too much, as it turned out. Way too much. For all of Winston's precision, often he was throwing to teammates who didn't have anybody in dressed in blue within arm's reach. If Savage was nervous about kick-starting a collegiate career that was on life support for more than two years, it didn't show. The quarterback who led Rutgers to a 12-1 record as a freshman in 2009 hit Devin Street for a 31-yard gain on Pitt's first drive, Savage's first completion in a game in 1,024 days. Florida State's first drive fizzled. The second ended with Winston hitting O'Leary - the grandson of golfing great Jack Nicklaus - for a 24-yard touchdown. The two hooked up again on the next drive, with Winston executing a perfect play fake before flipping the ball to O'Leary in the back of the end zone to give Florida State a 14-10 lead. Savage threw an interception on Pitt's ensuing possession and Winston needed all of three plays to put things out of reach. When an illegal block and a delay of game had the Seminoles facing first-and-28, he found Greene down the sideline with a perfect throw to Greene's back shoulder. On the next snap Winston found Greene over the middle for a score to put the Seminoles up 28-10.